Capt John Leech Archives - Lake Toho Guides - The Ultimate Orlando Fishing Experience. The Great Outdoors is a wonderful place to spend time on special days. Whenever you are visiting Central Florida, you should always strive to get outdoors. Bass fishing is a great way to do that. 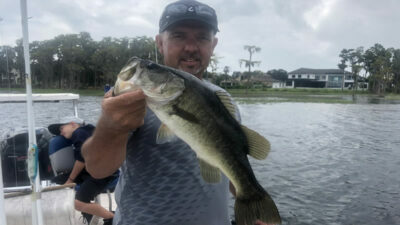 Come set the hook on an Orlando birthday bass fishing charter that can get you addicted to the sport forever. You never know where that will lead you or what you will catch on the other end of the line. Our local experts are highly knowledgeable in the areas to catch largemouth bass. They spend countless hours of practice, patience and hard-work in order to determine the best spots and techniques. As a result, you can be sure to experience the best bass fishing possible. Furthermore, you are going to be fishing with our professionals with professional equipment. Enjoy the learning process and the great outdoors with Captain John Leech and Captain Brent Nelson. Captain John Leech had the pleasure of fishing with Rob and Robbie. They were traveling to Central Florida in search for some excellent bass fishing. It was Robbie’s 13th birthday and there was no better way to spend it than on Lake Toho. They live in the Orlando area and were searching for a great outdoor activity. Rob was taking a break from traveling around with his band. Fishing conditions were tougher in the morning but got much better as the day went on. Rob and Robbie were catching them up and put some quality bass and numbers in the boat. Robbie caught his birthday present with a 5 pound largemouth bass in the boat. Also, he caught a chain pickerel as well. Rob and Robbie had an awesome time while Lake Toho Bass Fishing. This location just south of Orlando is the perfect getaway! Captain John is looking forward to fishing with these fine gentlemen again in the future. Just shortly after this fishing charter, another one of our local experts explored the Butler Chain of Lakes. Captain Brent Nelson had the pleasure of fishing with Bruce and his sons Tanner, Taylor and their grandfather Steve. The Butler Chain came in strong for this family. They were fisherman traveling from Arizona to catch some Florida largemouth bass. Bass fishing has been incredible this time of year in Central Florida. The fish are schooling strong early in the morning as well as later in the evening. Whether you want to catch them on artificial baits or live shiners, you can get the job done. Throw top water baits or rattle traps in schools and pick off some excellent bass. Bruce and his family caught 40 largemouth bass up to 3 pounds. Captain Brent Nelson is looking forward to catching more quality bass with this family in the future! Florida bass fishing is only getting better. As the temperatures begin to drop, the bass will begin to bite stronger. Get ready for an awesome spawning season that is coming up in the next couple of months. If you are looking to cash in on some big bass, Orlando is the place to visit! We look forward to seeing you on the water next time! Come Experience Kissimmee and Catch Yours Today with Captain Brent Nelson on Lake Toho. Kissimmee is a beautiful place to visit when traveling to Central Florida. The freshwater bass fishing is absolutely amazing and you can make some great memories with your loved ones. Kissimmee big bass trips are all you need in order to have some fun on the water. Lake Tohopekaliga is a fantastic bass fishery to explore when visiting Kissimmee. If you are looking for quality fishing all year long this is your destination. While either traveling through or to, make sure you check out this destination. Our local experts have spent years fishing this lake making sure that you get the best experience possible. Captain Brent Nelson had the pleasure of fishing with Kent and his wife. 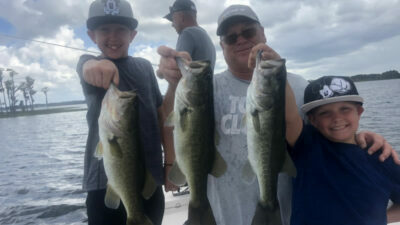 They were traveling to Central Florida looking to enjoy some time with family as well as get some bass fishing in. Just before this fishing trip there plane touched down. They had to race here in order to make it and get on the bass. It was not long until we got on the fish. Captain Brent did everything he could in order to prevent and dodge rain storms on the way to their first spots. The action was hot and heavy right from the start. All the fish were caught using wild caught live shiners. This is the best method to partake in if you are looking to catch some big numbers and quality of largemouth bass. Kent and his wife both caught their personal best Florida largemouth bass. The largest fish weighed close to 6 pounds. You truly can’t beat the action here in Central Florida. They are looking forward to getting back on the water with Captain Brent again soon! Just shortly after this amazing fishing trip, Captain John Leech adventured out Lake Toho Bass Fishing. Clifford and his son Christian were looking to cash in on the action here in Central Florida. Christian was starting at UCF and they wanted to get out on the water while they still could this summer. Clifford and Christian are both avid anglers. They went out in search for some big bass on artificial baits. It was a great trip with great numbers in the boat. The most effective artificial bait was a Texas rigged speed worm. Christian knew how to work the worm just right in order to have some success. Lake Toho has been very productive lately and will continue this pattern through the end of the year. Clifford and Christian caught 22 largemouth bass with the biggest weighing in at 4 pounds. They were ecstatic to spend this time on the water with each other as well as catch some nice bass. Captain Brent Nelson is looking forward to the next opportunity to get out on the boat with this father son duo again! Don’t miss out on your adventure next time you are visiting Central Florida. Just getting out in the outdoors is well worth the experience. You never know what you will catch or see. Lake Toho has been a great lake to catch bass here in Kissimmee and the action will continue to get better. We look forward to seeing you on the water next time! Lake Toho is a great bass fishing location in Kissimmee, Florida. Travelers come to Florida for the bass fishing every year. 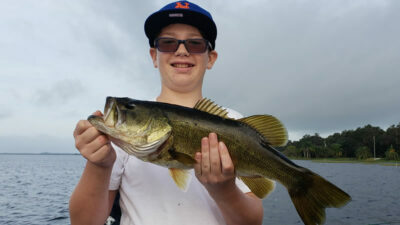 Kissimmee Bass Fishing Trips are a great way to get outdoors and experience Florida. Lakes here in Central Florida are stacked with excellent opportunities to catch that fish of a lifetime! Lake Tohopekaliga is located in Kissimmee, Florida. It is a large freshwater lake that produces amazing bass fishing year round. Big bass roam this lake and you can catch big numbers during the summer time. Our local experts especially Captain’s John Leech and Brent Nelson are knowledgeable of this fishery and all its potential. Captain John Leech had the pleasure of fishing with Russell and his buddy Casey. They were traveling all the way from Washington in order to set the hook into some Central Florida bass. Also, they were here to learn some new techniques for their craft in construction. When you have the opportunity to go Florida Bass Fishing, you must seize the moment. Russell and Casey had a great day on Lake Toho. It was a quick 4 hour fishing trip with the biggest bass weighing in at 6.12 pounds. You can’t beat that when hopping on a last minute fishing charter. This was Casey’s first bass fishing trip along with his biggest fish! Captain John is looking forward to the opportunity to catch some more bass with these great guys in the future! Captain Brent Nelson had the pleasure of fishing with John, James, JD and Cliff. They had a blessed morning of bass fishing on Lake Toho. These gentlemen were traveling from Atlanta, Georgia looking to catch some quality bass. When you adventure out on a 6 hour fishing trip, you have to know that you are going to catch some good numbers especially during these summer months. Wild caught live shiners were the most effective bait on this fishing trip. When you have a lot of people on the boat, it can get difficult to throw artificial baits. These gentlemen while Lake Toho Bass Fishing putting nearly 50 largemouth bass in the boat. Most of these bass were in the weight range of 3-4 pounds with the largest weighing in at 5 pounds. It was a great day on the water and one of their best days ever. Lake Toho is producing especially during these summer months. Captain Brent is looking forward to fishing with these guys again in the future. They said they could not wait to come back next year! When you adventure out on a fishing trip with local experts, only good things could come. Whether you want to catch big bass or big numbers, we have you covered. 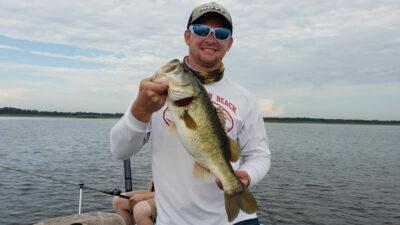 Lake Toho Bass Fishing is by far the best destination for you in Central Florida. Bring your families along for a trip of a lifetime! Orlando is the perfect location to come catch your trophy largemouth bass you have been dreaming of. You never know what will happen when you adventure out on an Orlando Fishing Monster Bass on Lake Toho in Central Florida. I had the pleasure of fishing with Mike Watson, Jim and Miguel. They wanted to explore what Florida Bass Fishing had to offer while visiting this beautiful state. We had a fantastic day out on the water. One of those days that goes down in the books. Lake Toho is producing some amazing fishing conditions that we would love for you to experience. We ran through 7 dozen shiners on our trip today catching 50 bass. Miguel caught his personal best largemouth bass weighing 9.14 pounds. A true Monster bass you don’t get to see every day. These bass are on and it is a great time of year to catch a great number of fish with some excellent quality. Florida Bass are up shallow and they are out deep. Partly Cloudy fishing conditions made for this perfect day out on the water. We found these fish in multiple different locations. Mike, Jim and Miguel had a great day out on the water and I am looking forward to fishing with them again soon! When you visit Florida, make sure you spend ample time in the outdoors. Busy schedules at work can really prevent you from experiencing all this amazing world has to offer. 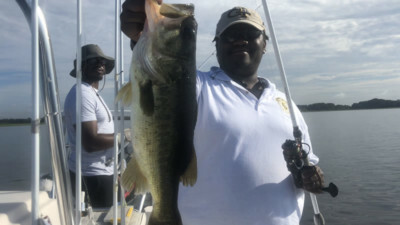 Two Days Orlando Fishing can really help connect you back to the outdoors. I had the pleasure of Lake Toho Bass Fishing with Ivan Howard. Ivan is a repeat of Captain Steve but he was not able to fish with him on these trips. Ivan came out for two days of excellent fishing. Wild caught live shiners were the most effective method on both trips. We went through 5 dozen shiners in less than 4 hours on both days. The action is picking up here in Central Florida and we do not want you to miss it. Largemouth bass are starting to make their transition and feeding up for their upcoming spawns. Ivan caught 80 bass total for both days weighing up to 5 pounds. He was excited to experience this Florida Fishing action. We are looking forward to fishing with Ivan again on another great trip out on the water. Orlando Fishing is a must experience when traveling to Florida. Largemouth bass reign supreme and you can catch an abundance of bass this time of year. Enjoy a Split Day Bass Fishing trip of a lifetime next time in Central Florida. I had the pleasure of fishing with Troy, Frankie and Ralph. They were family-in-laws that really enjoyed Florida Fishing especially for largemouth bass. A split day bass fishing is a perfect amount of time to catch a large quantity of fish. It is not every day that the customer also buys 10 dozen shiners and we go through them throughout the trip. Before we had lunch, we fished 6 dozen. After lunch, the wind changed direction to an east wind of 10-15 mph. We found a spot that was tucked in and proceeded to catch a good number of largemouth bass. Troy, Frankie and Ralph put 70 bass in the boat mostly weighing from 3 to 4 pounds. They caught fish until it started to hurt. You really can’t beat a day like that on the water. I am looking forward to fishing with them again in the future.